Office 365 Content Delivery Network (CDN) provides you an easy solution to host your assets directly from your own Office 365 tenant. It can be used for hosting any static assets that are used in SharePoint Online. There are multiple different hosting options for your web part assets. This tutorial concentrates on showing the Office 365 CDN option, but you could also use the Azure CDN or simply host your assets from SharePoint library from your tenant. In the latter case, you would not benefit from the CDN performance improvements, but that would also work from the functionality perspective. Any location that end users can access using HTTP(S) would be technically suitable for hosting the assets for end users. Ensure that you have the latest version of the SharePoint Online Management Shell by downloading it from the Microsoft Download site. If you are using a non-Windows machine, you cannot use the SharePoint Online Management Shell. You can, however, manage these settings by using Office 365 CLI. Connect to your SharePoint Online tenant with a PowerShell session. Get the current status of public CDN settings from the tenant level by executing the following commands one-by-one. 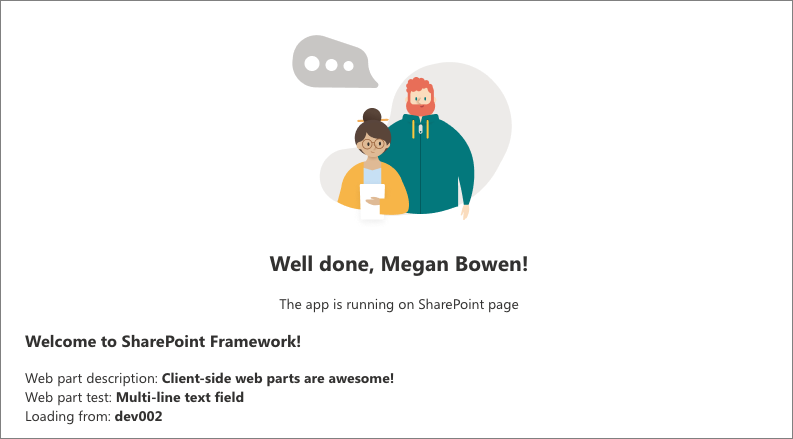 SharePoint Framework solutions can automatically benefit from the Office 365 Public CDN as long as it's enabled in your tenant. When CDN is enabled, */CLIENTSIDEASSETS origin is automatically added as a valid origin. Enable public CDN in the tenant. Confirm settings by selecting Y and then Enter. Now the public CDN has been enabled in the tenant by using the default file type configuration allowed. This means that the following file type extensions are supported: CSS, EOT, GIF, ICO, JPEG, JPG, JS, MAP, PNG, SVG, TTF, and WOFF. SharePoint Framework solutions can automatically benefit from the Office 365 Public CDN as long as it is enabled in your tenant. When the CDN is enabled, the */CLIENTSIDEASSETS origin is automatically added as a valid origin. Notice that when you enable the CDN for the first time, the default configuration to enable default origins will take a while (approximately 15 minutes). Configuration is completed when there is no (configuration pending) messages when you execute the Get-SPOTenantCdnOrigins -CdnType Public command. When the origin is listed without the (configuration pending) text, it is ready to be used in your tenant. This is the indication of an on-going configuration between SharePoint Online and the CDN system. Switch to the console and make sure you are still in the project directory that you used to set up your web part project. Open the HelloWorldWebPart web part project in Visual Studio Code or your preferred IDE. Open package-solution.json from the config folder. The default value for the includeClientSideAssets is true, which means that static assets are packaged automatically inside of the .sppkg files, and you do not need to separately host your assets from an external system. Do not change this setting for this exercise, so that assets are automatically hosted when solution is deployed to your tenant. If Office 365 CDN is enabled, it is used automatically with default settings. 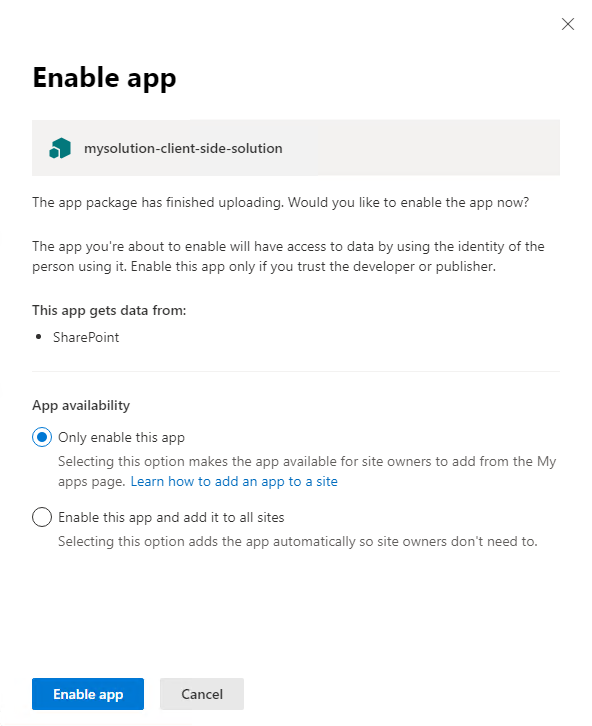 If Office 365 CDN is not enabled, assets are served from the app catalog site collection. This means that if you leave the includeClientSideAssets setting true, your solution assets are automatically hosted in the tenant. Execute the following task to bundle your solution. This executes a release build of your project by using a dynamic label as the host URL for your assets. This URL is automatically updated based on your tenant CDN settings. Execute the following task to package your solution. 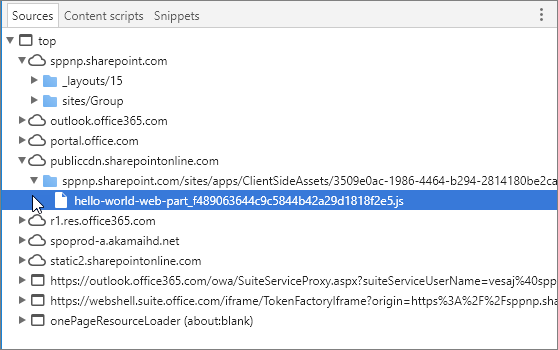 This creates an updated helloworld-webpart.sppkg package on the sharepoint/solution folder. 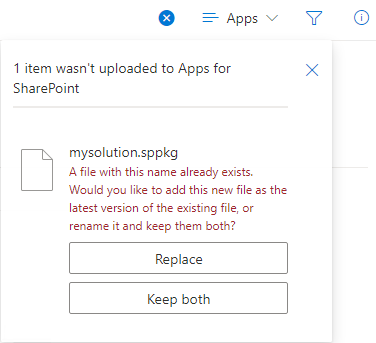 If you are interested in what actually got packaged inside of the sppkg file, you can look in the content of the sharepoint/solution/debug folder. Upload or drag and drop the newly created client-side solution package to the app catalog in your tenant. Because you already deployed the package, you are prompted as to whether to replace the existing package. Select Replace It. Notice how the domain list in the prompt says SharePoint Online. This is because the content is either served from the Office 365 CDN or from the app catalog, depending on the tenant settings. Select Deploy. Open the site where you previously installed the helloworld-webpart-client-side-solution or install the solution to a new site. 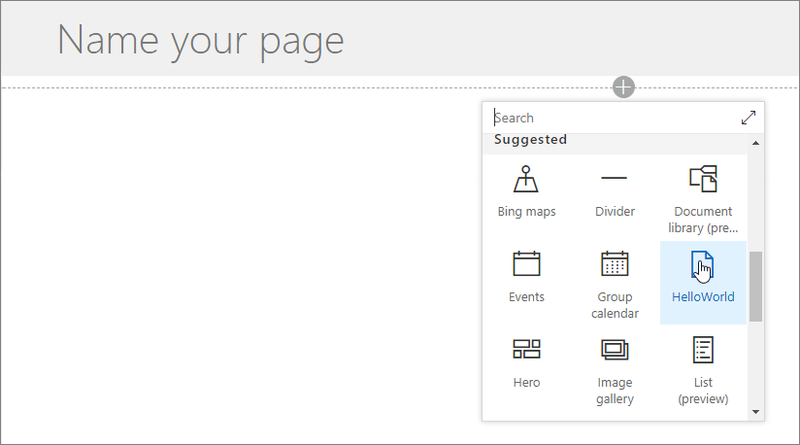 After the solution has been installed, select Add a page from the gear menu, and select HelloWorld from the modern page web part picker to add your custom web part to page. Notice how the web part is rendered even though you are not running the node.js service locally. Save changes on the page with the web part. Select F12 to open up developer tools. Extend publiccdn.sharepointonline.com under the source and notice how the hello-world-web-part file is loaded from the Public CDN URL pointing dynamically to a library located under the app catalog site collection. If you would not have CDN enabled in your tenant, and the includeClientSideAssets setting would be truein the package-solution.json, the loading URL for the assets would be dynamically updated and pointing directly to the ClientSideAssets folder located in the app catalog site collection. In this example case, the URL would be https://sppnp.microsoft.com/sites/apps/ClientSideAssets/. This change is automatic depending on your tenant settings and it does not require any changes in the actual solution package. Now you have deployed your custom web part to SharePoint Online and it's being hosted automatically from the Office 365 CDN. You can load jQuery and jQuery UI and build a jQuery Accordion web part. To continue, see Add jQueryUI Accordion to your client-side web part.